Solar Photo Voltaic (PV) renewable power systems use an bi-directional inverter system that converts the DC power from the solar array into an AC source to power local electrical loads and feed into the mains power supply. The latest generation grid-tied solar inverters can also be installed with an energy storage battery pack to provide back-up power when the mains power fails or the sun stops shining. The battery pack requires a DC charging circuit and some sophisticated controls to ensure the pack is discharged safely. Some solar inverters have an integrated DC charging circuit run from their internal rails and this can be used to charge a connected battery set. Where this is not possible, a separate battery charger and even additional inverter, supply circuit and switchgear may be necessary. Storing power in battery packs for later discharge is becoming popular for a number of reasons. At the grid level, large Mega-Watt battery packs can be used to store power from off-shore wind or on-shore solar farms and fill in peak demand periods. In domestic, commercial and agricultural environments, energy storage can be used to power electrical circuits rather or allow a site to become completely ‘off-grid’ and self-powered. Some inverter systems can also be configured for multiple inputs including a local standby power generation for complete self-sufficiency. A unique feature of a solar inverter is its Maximum Power Point Tracking (MPPT). This reduces the potential for waste energy and system losses. It all comes down to Ohm’s Law where Power = IV Watts = Amps x Voltage. At its highest Mid Point Power voltage, the solar inverter can generate an AC power from a lower Mid Point Current. This results in a higher conversion efficiency and can also be useful over long cable runs to reduce transmission losses. The higher voltage also allows more solar PV modules to be added to the array to provide redundancy should a panel fall into shade (from cloud, trees or local building structures). When operated in shade, the less efficient solar array string voltage will drop close to or lower than a connected battery. Two things make a grid-tied solar inverter and energy storage pack attractive. Firstly, the Mid Point Power (MPP) tracking is almost 100% accurate. 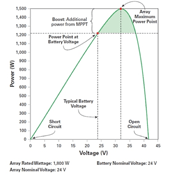 Algorithms are used to scan the solar PV array’s I-V curve from the battery voltage up to open circuit voltage to ensure ensure the right MPP boost is chosen in the shortest time period possible. Intelligent communication capabilities within the solar inverter also ensure automatic co-ordination between inverters to optimise performance. Most solar inverters can be used within SNMP TCP/IP environments or with the more industrial-based Modbus protocol. Advances have also been made in how energy storage battery packs are charged and discharged. Principles have been adopted from uninterruptible power supplies (another back-up power device) to manage and therefore extend the full operating life of a battery set. Charging circuits can be set to only operate when a battery falls below a pre-set limit, preventing power from the array being used to recharge the battery set following a small discharge period (mains power failure). Demand for energy storage in developed countries is small but will grow through incentives, a increased potential for mains power failures and potentially rising energy costs. An optimised system could provide night-time power at a lower cost than grid sourced electrical power, especially where night-time demand is minimal compared to the amount of power generated during daylight. This power could also be lower cost than could be achieved by a local standby power generator. Key to its success will also be advances in battery development as a long-life (10-15 year) battery is required that can be used within high-rate charge/discharge applications.